Mohamud Noor campaigns for change. Mohamud Noor understands why every single vote matters—and more so now than ever. 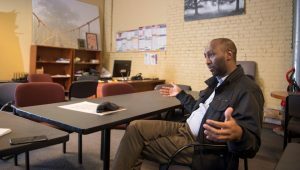 Nineteen years after arriving in the United States from war-torn Somalia, the 40-year-old is set to become the first Somali-American man elected to a state house. A lot is at stake in Minnesota’s midterm polls, with an open race for governor, two Senate seats, a competitive attorney general race, and several hotly-contested congressional races. Yet Noor is far from being the only Somali who will be making history on the ballot. In the Minnesota state legislature, he will be joined by Hodan Hassan who will be the second Somali-American woman to be elected to that position. That ceiling was first shattered in 2016 by Ilhan Omar, who is on course to become the first African refugee and one of two Muslim women elected this year to the US House of Representatives. Fardousa Jama is running for a city council position in Mankato city, the first Muslim woman to do so in south-central Minnesota while Siad Ali is also running for a second, four-year term on the Minneapolis school board. More than anywhere else in the US, Somalis have carved a niche in local elective politics in the North Star state. With an estimated population of 150,000, the United States is home to about 7% of the world’s Somali migrant population, many of them in Minnesota, according to the United Nations. But they are by far the most important diaspora bloc, acting as a lifeline for thousands of families back in Somalia who rely on their remittances to get food, shelter, healthcare, and education. Decades after fleeing their own fractious nation, their rise as a crucial voting bloc is a telling reflection of a maturing polity and shows the gradual but vital strides the community has made despite everything. Their electoral success, especially in the 2018 midterms, is also a story about the American dream and lies at the intersection of migration, gender, religion, race, ethnicity, and the place of the African diaspora in the US political discourse. Minnesota has some of the highest voter turnouts in the US, and that feverish engagement hasn’t abetted in the current polls. More than 500,000 Minnesotans have voted early this year, a record level. Noor is, however, not heeding those numbers or “trusting the polls.” On a cloudy and cold Minneapolis morning, he drives around to get voters out around the Riverside Plaza, a six-building, colorful but drab housing project that’s mostly populated by East Africans. The state allows constituents to cast their vote before election day by absentee ballot without providing a reason, and Noor’s campaign was utilizing that to get their supporters out. So far, their door-to-door campaign had succeeded in getting 1,300 people to vote early; only 400 had done so this early in the primary polls in August. The 60B district has over 22,600 registered voters and Noor got 2,909 in the Democratic primaries, 833 votes ahead of his closest rival. They were working out of a “sense of urgency,” Noor said because the “values we stand for are under attack.” The Somali community faces issues related to employment, affordable housing, quality education, and access to good healthcare—concerns that candidates like Noor hope to tackle once elected. But more than anything, the community has come under heightened scrutiny as president Trump ascended to power. Ilhan Omar knocking on doors in Minneapolis. During the presidential elections, Trump singled out Somalis multiple times, accusing the predominantly Muslim community of coming from “dangerous territories,” fraying social nets, and blamed faulty vetting processes for allowing a large number of Somalis to come to states like Minnesota and Maine. The subsequent travel ban, which included Somalia, also meant families couldn’t be reunited. The administration’s hardline approach to immigration also saw the number of deported Somalis more than double in a year. To get citizens to exercise their right, the campaign to vote has gone to mosques, malls, and madrassas. Around the state, clerics have been asking congregants to vote; candidates have hung their posters and stumped in popular Somali hangout spots like Karmel Mall; young volunteers have been knocking on doors to agitate both young and old to register and vote. On social media platforms, some activists have also taken to posting political messages in Somali, while media outlets like the Minnesota Public Radio published in Somali a guideline to where candidates stand on major issues. A victory at the ballot box also serves as an inspiration for younger generations and encourages them to see public service as a worthwhile goal says Osman Ahmed, who unsuccessfully bid for office in the primaries and worked with former state senator Al Franken. “The representation of it does matter,” he said. Najmia Abdishakur (2nd L), a Somali national who was delayed entry to the U.S. because of the travel ban, is greeted by her mother Zahra Warsma on Feb. 6, 2017. But while many candidates run as part of the “blue wave,” voters like Abdi Mohamed are out to show that Somalis in Minnesota are not an electoral monolith. Born in Mombasa, Kenya, Mohamed’s family came to the US as a child. A student at the U of M, he actively campaigned for Obama and Omar in the past but switched parties and voted for Trump in 2016. A delegate of the Somali American Republicans of Minnesota group, the 25-year-old says he’s dissatisfied with the way the Democratic–Farmer–Labor Party, an affiliate of the Democratic party, has provided “lip service” to the Somali community without addressing the major issues affecting them. Instead of championing free markets, reining in the surveillance states, and overseeing progressive economic policies, the Democratic party, he argued, is too focused on identity politics. And while he thinks candidates like Omar is “demonstrably ill-experienced” to lead in Washington, he hopes she will do good by the Somalis and the constituency that elects her. Representing their constituencies widely and fairly will be something that faces many of the new Somali-American leaders. Even though the community navigates complex identities, Minnesota is among the worst states in America for racial inequality. But in working to close the gaps in unemployment, income, and homeownership, Somali politicians don’t have to choose says Safy-Hallan Farah, a writer and editor.